On 16 March 2017, EUROMIL organised, in Lisbon, a roundtable meeting on the implementation of the EU Working Time Directive (2003/88/EC) in the Southern European armed forces. The implementation of the EU Working Time Directive (WTD) in the armed forces being a concrete issue for the Southern European countries, the meeting aimed at exchanging experiences and best practices as well as discussing challenges in relation to the implementation of the WTD in the armed forces from both within and beyond the region. The meeting participants included representatives of military associations, national authorities, political parties and trade unions in Southern Europe, as well as representatives of military associations from other parts of Europe and EUROMIL. The WTD requires EU Member States to protect the safety and health of workers and ensures the respect of specific rights, i.e. maximum weekly working hours, minimum daily and weekly rest, break, paid annual leave, extra protection for night work. Additionally, special rules are foreseen for workers in specific fields. According to its Art. 1, §3, the WTD applies to all sectors of activity, including public, within the meaning of Art. 2 of the Framework Directive on Safety and Health (89/391/EEC). The latter, which stipulates in Art. 2.2 that the Directive “shall not be applicable where characteristics peculiar to certain specific public service activities, such as the armed forces (…) inevitably conflict with it”, have been used by some Member States to justify a blanket exemption of the directive for military personnel. However, it was confirmed by the European Commission that military personnel are not excluded from the Framework Directive on Safety and Health and consequently the Working Time Directive. In specific circumstances, e.g. missions, exercises or guards, adopting restrictions might be necessary. However, these activities must be precisely defined and delimited and should not be exempted from protection measures. This was clarified by several judgements of the European Court of Justice. Moreover, the right to fair and just working conditions is conferred by the Art. 31 of the EU Charter of Fundamental Rights. Like any other worker, a soldier deserves the best possible working conditions, which includes an appropriate working time regulation. In countries where the EU WTD is not or only partially implemented and where no national working time regulation for military personnel exist, the commander arbitrarily decides on working time. In addition to the risk of creating health and safety issues for the personnel concerned, the lack of working time regulation conflicts with the principle of having democratic and modern armed forces reflecting the society we live in. Unlike personnel from the other public security sector, Cypriot military personnel are not subjected to a working time regulation and overtime is not paid. Working hours are currently regulated by internal directions of the Chief of the National Guard. The problem was acknowledged by the Ministry of Defence and military associations are advocating for a working time regulation to be adopted by the Parliament. However, the discussion is blocked and associations are considering undertaking legal actions as a last resort. In Greece, the military association P.F.A.F.U conducted a research in 2015, revealing that military personnel work in average 65 hours per week. Nothing is seriously regulated for the working time of Greek military personnel. They should permanently be available and the compensations they receive are purely symbolic. In Malta, an agreement has been concluded for the period of the Maltese Presidency of the Council of the EU regarding overtime compensation for military personnel. After this period, a new agreement should be agreed on. An overall regulation is missing. The European working time directive has not been implemented in the Portuguese armed forces. Military personnel should be permanently available. Overtime is thus considered as regular service and no compensation is foreseen. Consequently, changing mentalities is a prerequisite for adopting the necessary legislation. Two regulations exist regarding working time in the Spanish armed forces (Orden DEF/253/2015 on annual leave, permissions, reduced working hours and licenses and Orden DEF/1363/2016 on working day and regular schedule). Broadly speaking, the content of the WTD is reflected in the national regulations but some challenges remain, i.e. permanent availability of service, reconciliation between work and family life, financial compensation, and overtime still under commander’s decision. Best practices and progresses concerning the implementation of the EU Working Time Directive in the armed forces should nevertheless be highlighted. Germany amended its legislation in 2016 to adopt a working time regulation for its soldiers. §30 of the Soldiers Act ensures that soldiers are considered as workers and that their regular activities fall within the scope of application of the WTD. Specific activities are excluded from this scope but are clearly defined, i.e. service on seagoing vessels, foreign assignments, military exercises and administrative aid. This change of legislation took place further to a court case brought by the German armed force association (DBwV) at the Federal Administrative Court, which considered in 2011 that the WTD is applicable to military personnel. Further to this decision, KPMG was commissioned by the Ministry of Defence to conduct a study on the working time and applicability of the WTD to military personnel with the aim of enhancing the attractiveness of the service in the armed forces. The report was published in 2013 and a new law enacted. Consultations, in which DBwV participates, are currently ongoing with the Ministry of Defence to continue improving the recently adopted working time regulations. In Ireland, the Government recently decided to remove the blanket exclusion of military personnel from the WTD. Until now, police and military personnel were excluded from any working time regulation in Ireland. Like in Germany, court cases and other actions were taken against Ireland for failing to recognize military personnel the basic rights set out in the WTD, particularly to what concerns leave and holiday pay. The Irish association PDFORRA underlines that European laws apply to military personnel and is now looking forward to actively engage in consultations with the Defence Department to implement the WTD in the Irish Defence Forces. Participants in the meeting emphasized specific issues they believe deserve particular attention, namely the definition of working time, travelling time, exemptions and exclusions, flexible working time, the calculation of hours worked, compensation for overtime and the notion of permanent availability. Although it is up to Member States to implement the WTD, it was agreed that it would be helpful if the European Institutions could clearly stipulate in their documents that the WTD is applicable to armed forces personnel with specific exceptions. After seven years of unfruitful negotiations with workers and employers’ representatives, the European Commission announced in 2017 that instead of reviewing the Directive, it will issue an interpretative communication on the WTD in March 2017, complementing the European Pillar of Social Rights. A report on the implementation of the Directive by Member States will be published together with these two expected documents. 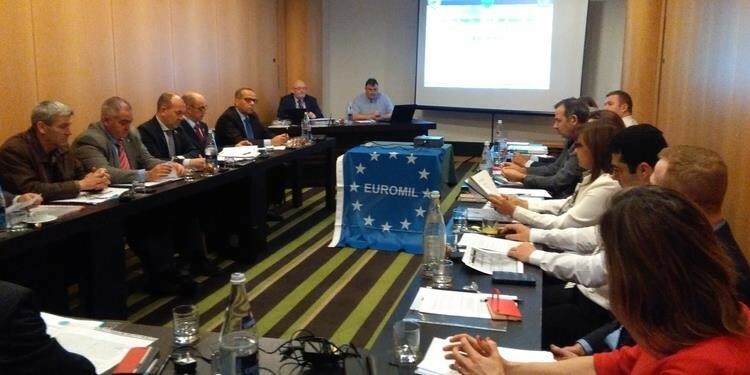 EUROMIL is looking forward to see whether they will reflect the position supported by the organisation since 2010 and will continue supporting its members on this important matter.